Writing and Publishing: Where Do I Start? I wanted to write a novel, so to begin, I wrote a novel. I thought this made a terrific amount of sense. Turns out, this might not have been the best first step. In retrospect, I think it maybe should have been number four. So what should have come first? I wish I had read more on how to write well. I had two college degrees, could construct complete sentences, and read a lot. In my mind, that was all I needed to be off and running. 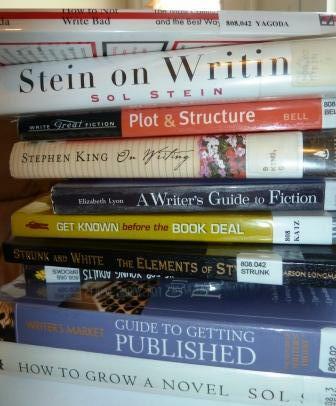 Perhaps if I hadn’t had an idea for plot or characters, I might have slowed down enough to consult some writing guides or gone to a conference or two. It wasn’t until I began the process of editing that I bothered to do any research on the craft of writing. This isn’t to say that my first draft was worthless. Still, I could have saved myself a lot of revision time if I had just known beforehand simple rules like using “all right” not “alright.” That correction might just take a minute or two with a find and replace command, but there were other errors that weren’t as quick fixes. For example, I had incorrectly used the subjunctive case repeatedly. What’s the subjunctive case you ask? Yeah, I didn’t know either, and that was part of the problem. This is my current stack of reading. Not only have I learned how to avoid common grammatical pitfalls, but I have gleaned a lot of wonderful advice on how to make my writing more precise, detailed, and clear. As I make my way through all of them, I’ll be adding the helpful ones to a resources page on the blog. For right now, if you only read one book, make it Ben Yagoda’s How to Not Write Bad. Yagoda is a professor at the University of Delaware, and the book came out of the mistakes he observed students making over and over in his twenty years of teaching writing. I am a notorious cheapskate when it comes to buying books. Why do libraries exist if not for taxpayers to subsidize my book addiction? After reading Yagoda’s book, however, I immediately bought a copy. It’s a reference you’ll return to over and over. He also has a helpful website. Up Next: Discover Your Market or How I Discovered I Wrote a Novel for a Nearly Nonexistent Market. Oops.